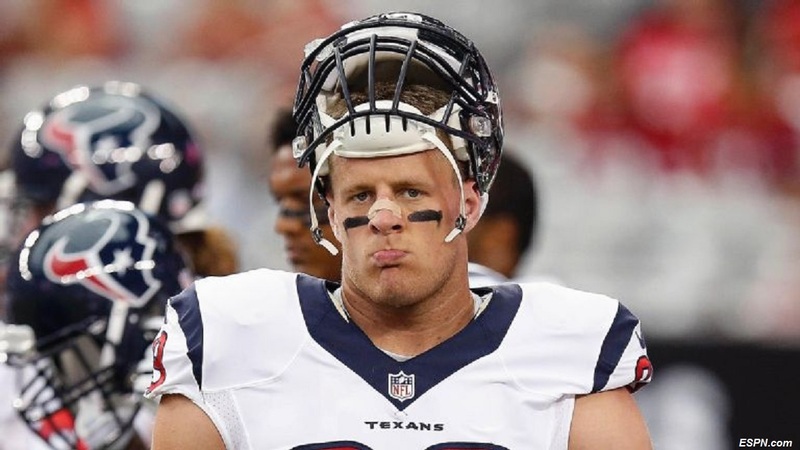 The Houston Texans and all-world defensive lineman J.J. Watt travel to take on the undefeated Atlanta Falcons in NFL Week 4. Dave Archibald has a two-part preview, focusing on the unstoppable Julio Jones in Part 1 and here, on the matchup between Devonta Freeman against the Texans linebackers. While the back end of the Texans defense is solid, the linebackers have had their share of struggles in 2015. Football Outsiders ranks them 24th in defending tight ends and 27th against running backs in the passing game. Part of that is the competition they’ve faced – included in those numbers are tough matchups with Jamaal Charles and Travis Kelce of the Kansas City Chiefs and Greg Olsen of the Carolina Panthers – but part is also a linebacking corps that lacks the speed to keep up with dynamic talents at those positions. The linebackers can get by in vanilla coverage schemes, but when they try to get fancy they often overextend their capabilities. That often shows up on third-down plays, when Houston tries to sugar the A gap or use blitzes or games to confuse and harass opposing quarterbacks in passing situations. On 3rd-and-6 late in the fourth quarter, the Texans sugar the A gaps, lining up linebacker John Simon (#51) and safety Eddie Pleasant (#35) in the middle of the line of scrimmage as if to blitz. Both drop into coverage, however. Simon is responsible for Kelce (#87), lined up in the left slot. He has a lot of ground to cover, and at the snap Kelce runs a quick out, taking him farther away from Simon. It’s an easy completion, and when Simon charges in, out-of-control, Kelce dodges him and picks up yards after the catch and a key first down. The Falcons have the right weapon for taking advantage of Houston’s suspect coverage linebackers: second-year running back Devonta Freeman. Freeman had a breakout game against the Dallas Cowboys in Week 3, running for a career-best 141 yards and three touchdowns and adding another 52 yards on five catches. He might not pile up big numbers on the ground against Houston, but he is primed to do some damage in the passing game. Freeman (#24) lines up to Ryan’s left in backfield, with receivers Leonard Hankerson (#85) and Roddy White (#84) both lined up to the left side. White goes deep up the left hash mark, while Hankerson runs a shallow drag. These routes clear out the left intermediate area, and Freeman runs up the seam into this space. The New York Giants show a linebacker blitz, with Jonathan Casillas (#54) and Uani Unga (#47) both walked up the line of scrimmage. Unga rushes, but Casillas doesn’t, instead picking up Freeman in man coverage. He has too far to go, however, and takes a poor angle on the speedy halfback. Ryan zips the pass to Freeman and the Falcons have a first down. The Falcons have enough firepower that they ought to be able to move the ball against Houston’s defense, but they have to be willing to take what the Texans give them. They can attack the linebackers with Freeman and tight end Jacob Tamme if they stay patient. If they stick to that game plan, they will put up points and be on their way to a 4-0 record on the young season. Follow Dave on Twitter @davearchie. Dave Archibald knows pass defense, specifically how coverage, the pass rush, excellent cornerbacks, versatile safeties and in-game adjustments can make a big difference. Dave Archibald is a native New Englander who lives 15 minutes from Foxboro Stadium with his wife and two children. He writes about secondary play, statistics, team building, and whatever tangents his lifelong football education takes him on.